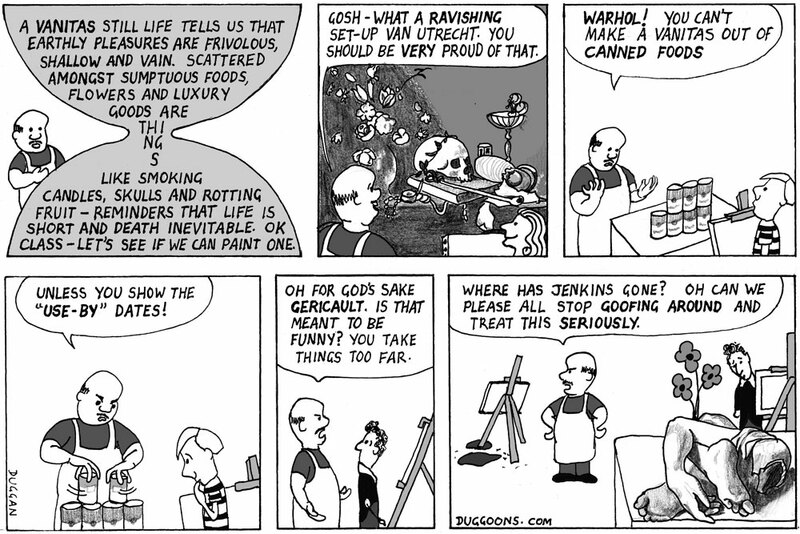 First published in The Guardian, 14 May, 2014. 147 people climbed onto a raft to escape The Medusa, a French frigate which had run aground on a reef off Senegal in 1816. Thirteen days later the survivors were picked up by another ship which had stumbled across them. There were just 15 left. In that time they had experienced things that make The Lord of the Flies look like a book about kids. In an effort to get The Medusa off the reef the decision was made to lighten the ship’s load by building a massive raft (20 metres in long and 7 metres wide) to carry the ship’s cargo. Three days after running aground, a gale developed and it was feared that the ship was about to break up. Mass panic broke out amongst the passengers and crew so the captain decided to evacuate immediately. Of the 400 people on the ship, only about 250 could fit on the six lifeboats, so they decided to tow the remaining people on the raft. 146 men and one woman boarded the hastily built raft, which partially submerged once it was loaded. The crew of the boats soon realised that towing the raft was impractical and began to fear being overwhelmed by the desperate survivors on the raft. They cut the ropes, leaving the raft and its occupants to their fate. On the raft the situation deteriorated rapidly. Fights broke out between the officers and passengers on one hand, and the sailors and soldiers on the other. There was no means of navigation or steering. The only food was a bag of ship’s biscuits (consumed on the first day), two casks of water (lost overboard during fighting) and a few casks of wine. On the first night adrift, 20 men were killed or committed suicide. Stormy weather threatened, and only the centre of the raft was secure. Dozens died either in fighting to get to the centre, or because they were washed overboard by the waves. Rations dwindled rapidly; by the fourth day there were only 67 left alive on the raft, and some resorted to cannibalism. On the eighth day, the fittest decided to throw the weak and wounded overboard, leaving fifteen men, all of whom survived until their rescue. This story became an international scandal and the 25 year old Theodore Gericault decided to make a name for himself by making a painting based on the incident. 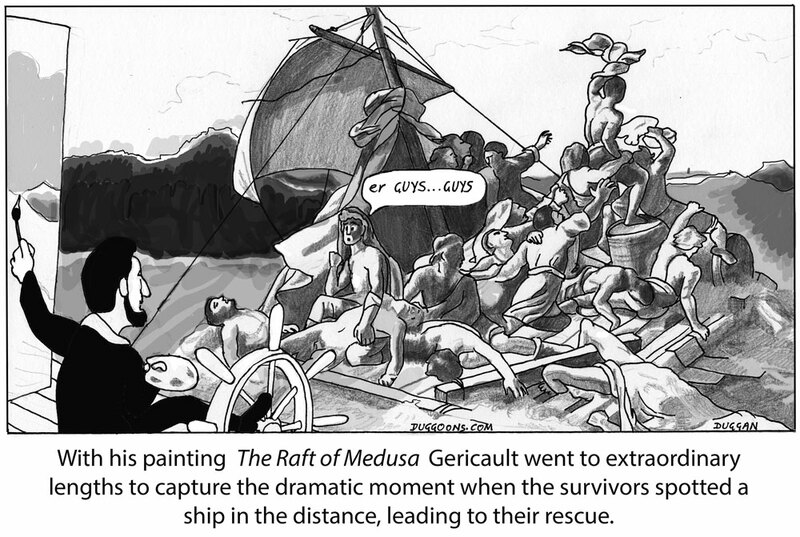 Gericault did indeed go to extraordinary lengths to paint The Raft of Medusa, as the cartoon says – just not these ones. He set up his studio across from Beaujon hospital. He studied the faces of dying patients, he made sketches of bodies in the hospital morgue, he brought severed limbs back to his studio to study their decay, and for a fortnight drew a severed head, borrowed from a lunatic asylum and stored on his studio roof. He met with survivors Henri Savigny and Alexandre Corréard, and their emotional descriptions of their experiences largely inspired the tone of the final painting. He worked with another of the survivors, the carpenter Lavillette, to construct an accurately detailed scale model of the raft, which was reproduced on the finished canvas, even showing the gaps between some of planks. Géricault posed models, compiled a dossier of documentation and copied relevant paintings by other artists. Despite suffering from fever, he travelled to the coast on a number of occasions to witness storms breaking on the shore. The result of all this is a magnificent painting that is perhaps the best example in the history of art of youthful ambition completely fulfilled. Go to the Louvre and see it for yourself. It is overwhelming; the foreground figures are twice life-size. Gericault even took the painting to London where 40,000 people paid money to see it. The painting quickly became the icon of the French Romantic movement. It’s well known that the French know a thing or two about romance so I took the hint and booked a Valentine’s Day trip for the wife and I on a sinking raft with a bunch of cannibals. She threw the tickets back in my face! I’ve never seen her so furious. After a while I concluded that she was probably right – it would have been rubbish. Gericault himself died at the age of 32. If this was his idea of romance then I’m surprised he lasted that long.